Originally a nine-bedroom Georgian townhouse built in 1831 on the footpath leading to Kilburn Abbey, the building was later converted to flats where the most well-known resident was Maundy Gregory. In 1929, the Gramophone Company acquired the premises and converted it into studios. The property benefited from a large garden behind the townhouse, which permitted a much larger building to be constructed to the rear; thus, the Georgian façade belies the true dimension of the building. Pathé filmed the opening of the studios in November 1931 when Edward Elgar conducted the London Symphony Orchestra in recording sessions of his music. In 1934, the inventor of stereo sound, Alan Blumlein, recorded Mozart's Jupiter Symphony which was conducted by Thomas Beecham at the studios. The neighbouring house is also owned by the studio and used to house musicians. During the mid-20th century, the studio was extensively used by leading British conductor Sir Malcolm Sargent, whose house was just around the corner from the studio building. The Gramophone Company merged with Columbia Graphophone Company to form Electric and Musical Industries (EMI) in 1931, and the studios later became known as EMI Recording Studios. In 1936 cellist Pablo Casals became the first to record Johann Sebastian Bach's Cello Suites No. 1 & 2 at the command of EMI head Fred Gaisberg. The recordings went on to spur a revolution among Bach aficionados and cellists alike. In 1958, Studio Two at Abbey Road became a centre for rock and roll music when Cliff Richard and the Drifters (later Cliff Richard and the Shadows) recorded "Move It" there, and later pop music material. Abbey Road Studios is closely associated with the Beatles, who recorded almost all of their albums and hits there between 1962 and 1970 using the four-track REDD mixing console designed by Peter K. Burkowitz. The Beatles named their 1969 album Abbey Road, after the street where the studio is located. The studio was renamed Abbey Road Studios in 1970 after the Beatles album had made it famous. Iain Macmillan took the album's cover photograph outside the studios, with the result that the nearby zebra crossing has become a place of pilgrimage for Beatles fans. It has been a tradition for visitors to pay homage to the band by writing on the wall in front of the building even though it is painted over every three months. December 2010, the zebra crossing at Abbey Road was given a Grade II listed status. Pink Floyd recorded most of their late 1960s to mid-1970s albums here, returning only in 1988 for mixing and overdubbing subsequent albums. Notable producers and sound engineers who have worked at Abbey Road include George Martin, Geoff Emerick, Norman "Hurricane" Smith, Ken Scott, Mike Stone, Alan Parsons, Peter Vince, Malcolm Addey, Peter Brown, Richard Langham, Phil McDonald, John Kurlander, Richard Lush and Ken Townsend, who invented the groundbreaking studio effect known as automatic double tracking (ADT). The chief mastering engineer at Abbey Road was Chris "Vinyl" Blair, who started his career as a tape deck operator. In 1979, EMI commissioned the British jazz fusion band Morrissey-Mullen to record Britain's first digitally recorded single record at Abbey Road Studios. From 18 July to 11 September 1983, the public had a rare opportunity to see inside the legendary Studio Two where the Beatles made most of their records. While a new mixing console was being installed in the control room, the studio was used to host a video presentation called The Beatles at Abbey Road. The soundtrack to the video had a number of recordings that were not made commercially available until the release of The Beatles Anthology project over a decade later. The Red Hot Chili Peppers used a photograph of the band walking across the zebra crossing naked (except for strategically placed socks) on the front of The Abbey Road E.P., which was released in 1988. In September 2005, American hip-hop artist Kanye West, backed by a 17-piece female string orchestra, performed songs derived from his first two studio albums at Abbey Road Studios. Recordings of these live renditions formed his live album, Late Orchestration, which was released in April 2006. The cover art for the album makes use of the famous zebra crossing with West's trademark 'Dropout Bear' seen walking across it. In June 2011, South Korean boy band Shinee performed at the studio as part of its Japanese debut showcase in partnership with EMI and the group's local record label SM Entertainment, becoming the first-ever Asian artist to perform in the studio. In November 2011, Australian recording artist Kylie Minogue recorded some of her most famous songs with a full orchestra at Abbey Road Studios. The album called The Abbey Road Sessions was released October 2012. In September 2012, with the takeover of EMI, the studio became the property of Universal Music. It was not one of the entities that were sold to Warner Music as part of Parlophone. In February 2017, a rare BTR-3 tape recorder, previously used at Abbey Road, was found by members of Surge Radio, the student-run radio station at the University of Southampton. The BTR-3 was donated to Abbey Road in April 2017. Abbey Road Studios got its start in the film scoring business in 1980 when Anvil Post Production formed a partnership with the studio, called Anvil-Abbey Road Screen Sound. The partnership started when Anvil was left without a scoring stage when Korda Studios were demolished. It ended in 1984 when EMI merged with Thorn Electrical Industries to become Thorn EMI. Abbey Road's success in the scoring business continued after the partnership ended. John Williams and the London Symphony Orchestra used the studios to record the scores of four films from the Star Wars franchise from Return of the Jedi in 1983 until Revenge of the Sith in 2005. All three film scores for The Lord of the Rings film trilogy (The Fellowship of the Ring, The Two Towers and The Return of the King), composed by Howard Shore and performed by the London Philharmonic Orchestra, were mixed at Abbey Road Studios. The recordings themselves were done by CTS-Lansdowne Studios at their permanent studios in the old Watford Town Hall with engineer John Kurlander. All technical support by CTS engineers. All recordings up to 96 tracks were in the digital domain. James Horner had also frequently used Abbey Road Studios as his recording base when recording scores in the UK. Abbey Road sound engineer Simon Rhodes had for over a decade served as his scoring mixer, both when recording in Britain and in the U.S.
Apple's iMovie 11's soundtracks of its trailers were recorded at the studio in early 2010. On 17 February 2010, it was reported that EMI had put the studios up for sale because of increasing debts. There was reported interest by property developers in redeveloping the site into luxury flats. It had also been reported there was a possibility the studios could be purchased by the National Trust to preserve what was in effect a historical building. Sir Andrew Lloyd Webber was reported to have bid £30 million to purchase the studios but was turned down by EMI. A Save Abbey Road Studios campaign attempted to ensure the premises remained a working studio. On 21 February 2010, EMI stated it planned to keep the studio and was looking for an investor to help finance a "revitalization" project. Meanwhile, the British government declared Abbey Road Studios a Grade II listed building which protected it from major alteration. The following December, the pedestrian crossing at Abbey Road was listed on the National Heritage List. Paul McCartney, speaking to BBC Newsnight on 16 February 2010, said there had been efforts to save Abbey Road by "a few people who have been associated with the studio for a long time," although he did not name them or include himself among them. "I have so many memories there with the Beatles," McCartney said, "It still is a great studio. So it would be lovely for someone to get a thing together to save it." The interior of Abbey Road contains many different works of art; in 2011 a piece of art, by Birmingham-based artist Annemarie Wright, was added which featured a handwritten list of all the artists that had recorded at the historic venue. Google has created an interactive virtual tour web app of the Abbey Road Studios. In March 2015, Abbey Road Institute was founded as a school for music production and audio engineering. In addition to the London location, Abbey Road Institute offers education globally with schools in Berlin, Frankfurt, Amsterdam, Paris and Melbourne. Students can study an Advanced Diploma in Music Production and Sound Engineering which has been developed in collaboration with industry leaders and the team at Abbey Road Studios. Discography in Sir Malcolm Sargent: a tribute (1967). London: Daily Mirror Newspapers. ^ Historic England. "Details from listed building database (1393688)". National Heritage List for England. Retrieved 18 May 2018. ^ Historic England. "Details from listed building database (1396390)". National Heritage List for England. Retrieved 18 May 2018. ^ "Studio 1". Abbey Road Studios; EMI Records Limited. Archived from the original on 14 July 2011. Retrieved 19 August 2011. ^ "Abbey Road studios given listed building status". BBC News. 23 February 2010. Retrieved 19 August 2011. ^ "Recording the Star Wars Saga" Retrieved 4 August 2012. ^ "Sir Edward Elgar, Master of the King's Music. "Land of hope & glory"". www.youtube.com. 1931. ^ Discography in Sir Malcolm Sargent: a Tribute. ^ Hewitt, Paolo (24 May 2000). "One for the road". www.theguardian.com. Guardian News and Media Limited. Retrieved 25 April 2018. ^ Siblin, Eric (4 January 2011). The Cello Suites: J. S. Bach, Pablo Casals, and the Search for a Baroque Masterpiece. Crows Nest, New South Wales: Allen & Unwin. p. unstated. ISBN 978-1-74237-159-7 – via Google Books. ^ "EMI puts Abbey Road up for sale: Ten things you need to know about the iconic recording studio". The Mirror. London. 16 February 2010. Archived from the original on 19 July 2014. ^ Bieger, Hannes (November 2012). "Abbey Road Studios, London." SoundOnSound.com. Retrieved 5 February 2019. ^ Lancy, Justin (23 October 2014). "The Technical Constraints That Made Abbey Road So Good". The Atlantic. Retrieved 14 February 2019. ^ Atkinson, Peter (2015). "Abbey Road Studios, the Tourist, and Beatles Heritage". Relocating Popular Music. pp. 129–147. doi:10.1057/9781137463388_7. ISBN 978-1-349-69057-2. ^ Pollard, Lawrence (7 August 2009). "Revisiting Abbey Road 40 Years On". BBC Online. Retrieved 2 November 2010. ^ Taylor, Matthew (2 January 2011). "Housing minister tries to save Ringo Starr's childhood home". The Guardian. London. Retrieved 19 August 2011. ^ Gramophone AUDIO NEWS: "EMI digital recording" July 1979. Retrieved 19 August 2010. "EMI digital recording". Archived from the original on 1 August 2012. Retrieved 25 August 2016. ^ "EMI Enters Digital Race with System", 26 May 1979 Billboard. At Google Books. Retrieved 23 April 2013. ^ The Beatles Book July & August 1983. ^ "샤이니, 英 애비로드 쇼케이스 성공리 마쳐 (Shinee, Lee finishes British showcase success)". Nate News (SK Communications) (in Korean). 21 June 2011. ^ "A Welcome Return For Lost Tape Machine". Abbey Road Studios. 12 April 2017. Retrieved 13 April 2017. ^ Ktorides, Christa. "RECORDING FILM SCORES WITH ABBEY ROAD AND BOWERS & WILKINS". DIY. Retrieved 25 January 2017. ^ Smyth, Chris; Power, Helen (17 February 2010). "End for Abbey Road? 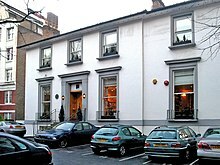 EMI puts Beatles' studios up for sale at £30m". London: The Times Online. Retrieved 19 February 2010. ^ TJ. "Should the National Trust save Abbey Road Studios". Nationaltrust.org.uk. Archived from the original on 17 August 2010. Retrieved 19 September 2010. ^ Nathan, Sara; Ben Todd (19 February 2010). "I'll save Abbey Road: Andrew Lloyd Webber promises £30m-plus to buy studios". London: Daily Mail. Archived from the original on 20 February 2010. Retrieved 19 February 2010. ^ "Stop the legendary studios becoming luxury flats". Save Abbey Road Studios!. February 2010. Archived from the original on 24 February 2010. ^ "Abbey Road studios 'not for sale,' says EMI". BBC News. 21 February 2010. Archived from the original on 22 February 2010. Retrieved 20 February 2010. ^ a b "Abbey Road studios to be listed by British authorities". The Independent. 27 February 2010. Archived from the original on 19 July 2014. ^ "Abbey Road Studios Grade II Listed". The National Heritage List for England. 23 February 2010. 1393688. Archived from the original on 19 July 2014. ^ "Beatles 'Abbey Road' crossing given heritage status". The Independent. 23 December 2010. Archived from the original on 19 July 2014. ^ Sisario, Ben (18 February 2010). "McCartney Expresses Hopes for Abbey Road". The New York Times. Retrieved 27 March 2010. ^ "Annemarie Wright creates Abbey Road art". Abbey Road Studios. 12 January 2011. Archived from the original on 15 January 2011. Retrieved 18 January 2011. ^ Tonkin, Sam (15 April 2015). "The virtual mystery tour! Beatles fans can now take a digital tour of Abbey Road studios using Google". Daily Mail. London. Retrieved 18 May 2015. ^ "Abbey Road Studios opens school of music production and sound engineering". factmag.com. Retrieved 25 January 2017. ^ Siddique, Haroon (19 March 2015). "Music institute opens in Beatles' Abbey Road Studios". The Guardian. Lawrence, Alistair (2012). Abbey Road: The Best Studio in the World. New York: Bloomsbury. ISBN 978-1-60819-999-0. Wikimedia Commons has media related to Abbey Road Studios.